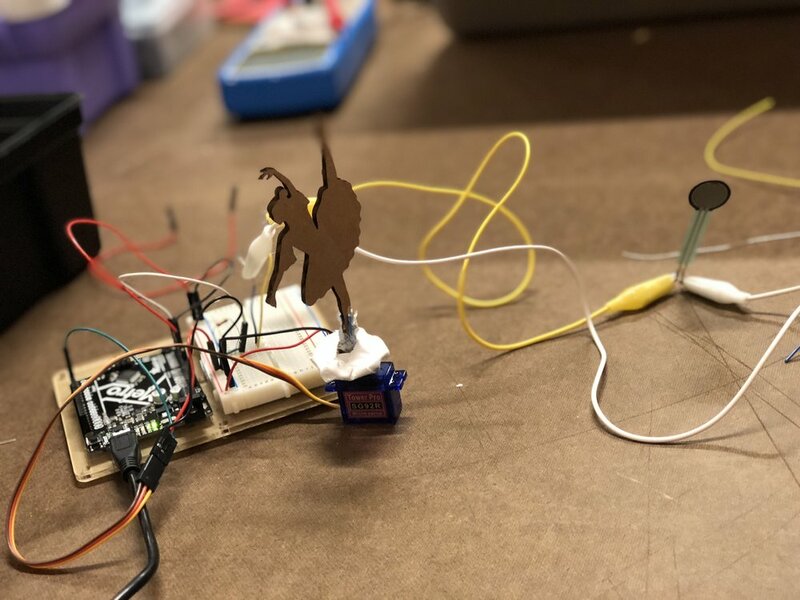 The labs this week were a lot of fun— it was cool to see what different inputs and outputs we could mix and match with the Arduino. I struggled to get the audio to work past the very basic tones, though—I’m definitely interested in understanding how to code the audio output better, as creating pieces that include music is a definite interest of mine. For my creative project, I decided to make the world’s least graceful ballerina by attatching her to a servo motor. Ideally, this project would be done with a motor that can turn 360 degrees, but it’s kind of a fun juxtaposition of the delicate ballerina and the (very) jerky motions. I also used alligator clips for the first time. My pressure sensor kept falling out of my breadboard, so in order to make the circuit more secure, I attached two wires to two alligators clips and connected a clip to each terminal of the pressure sensor. It worked much more reliably after that.